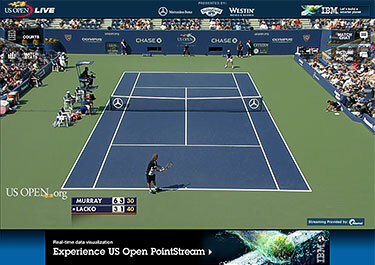 WHITE PLAINS, N.Y. – The USTA recently announced the return of the US Open National Playoffs for the third year. 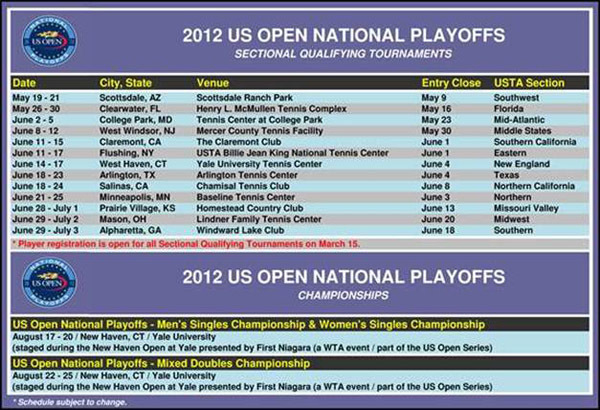 The US Open National Playoffs will again include both men’s and women’s singles and mixed doubles in 2012. The USTA created the US Open National Playoffs to expand the footprint of the US Open to cities nationwide by providing the opportunity for all players 14 years of age and older to earn a berth into the 2012 US Open. The US Open National Playoffs men’s and women’s singles champions earn a wild card into the US Open Qualifying Tournament, held the week prior to the US Open. The US Open National Playoffs mixed doubles champions receive a main draw wild card into the 2012 US Open. 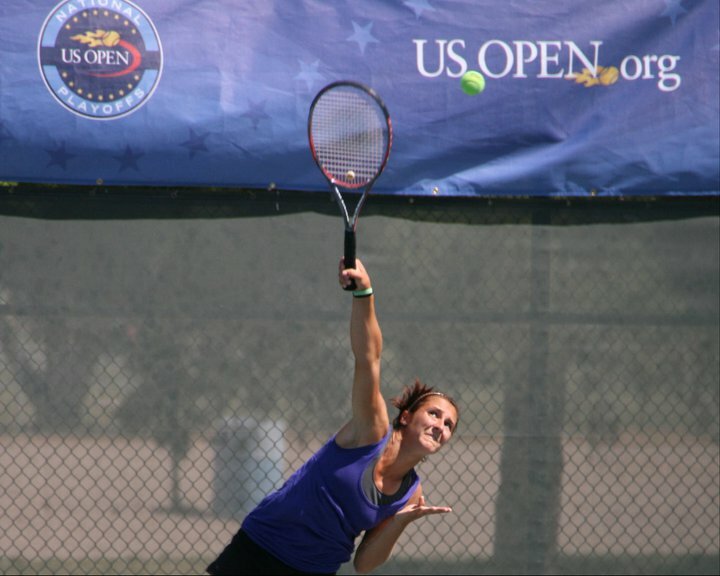 USTA Southwest will hold its US Open National Playoff Championship event on May 19-21 at Scottsdale Ranch Park, the same site as the 2011 event. Last year’s Southwest champions were Bojan Temunovic (men’s singles - pictured, below), Sylvia Kosakowski (women’s singles) & Sam Harrison and Nicole Melichar (mixed doubles). The US Open National Playoffs begin as a series of sectional qualifying tournaments and will be held in 13 USTA Sections throughout the country (see complete schedule on page 2). The 13 men’s, women’s and mixed doubles champions from each sectional qualifying tournament will advance to the US Open National Playoffs – Men’s Singles, Women’s Singles and Mixed Doubles Championship. All three tournaments will be held in conjunction with the New Haven Open at Yale, presented by First Niagara, a US Open Series event. Those events will be held in New Haven, Conn. The US Open National Playoffs – Men’s Singles and Women’s Singles Championship will be held August 17-20. The US Open National Playoffs – Mixed Doubles Championship will be held August 22-25. "The US Open National Playoffs is about giving players of all abilities the opportunity to dream big and be part of the US Open," said Jon Vegosen, USTA Chairman of the Board and President. "With the option to play singles and mixed doubles, players can compete where they feel the most comfortable on court to have the maximum US Open experience. These tournaments are sanctioned by our committed USTA Sections, who will facilitate competition so that all players feel like they had a special connection with the US Open." Registration for each of the 13 sectional qualifying tournaments begins on March 15 at www.usta.com/tennislink .The entry fee for each of the sectional qualifying tournaments is $100 for singles and $120 for each mixed doubles team ($60 per player). "For the third year, we again expect strong singles and mixed doubles competition among top junior players, collegians, teaching professionals, ‘weekend warriors,’ and recreational players to earn their way into the US Open," said Jeff Ryan, US Open National Playoffs Tournament Director. "The New Haven Open at Yale, presented by First Niagara, will also again serve as an ideal host for the championships, as it is a wonderful setting, never mind extremely convenient, for those winning players to travel to New York for the US Open." A player may only enter and compete in singles and/or mixed doubles at one sectional qualifying tournament during a calendar year. Players competing in men’s singles or women’s singles and mixed doubles may opt to compete at different sectional qualifying tournaments for each event (one for singles and one for mixed doubles). The draw size at each sectional qualifying tournament will be a maximum of 256 for each singles event and a maximum of 128 teams for mixed doubles. Participants can be of any playing level, from aspiring novice to seasoned professional, giving everyone an equal opportunity to advance. In all, 1,380 players (690 in men’s singles, 306 in women’s singles, and 384 in mixed doubles) competed in the 2011 US Open National Playoffs, ranging from experienced professionals (including former doubles world No. 2 and 2001 Australian Open mixed doubles champion Ellis Ferreira, two-time ATP singles champion Jeff Tarango, and former NCAA singles champions Amanda McDowell and Bea Bielik) to recreational players of all talents and walks of life (including ESPN’s Mike Greenberg, who teamed with six-time US Open champion Chris Evert in mixed doubles, jewelry store owner and young-adult fiction writer Shawn Cormier of East Brookfield, Conn., 65-year-old senior USTA League player Glenn Baxter, of Granbury, Texas, and the teenage brother-sister team of Samantha and Harrison Adams, who won the USTA Texas Sectional Qualifying Tournament). In the end, former University of Arkansas All-American Blake Strode, who deferred Harvard Law School to pursue a pro tennis career, won the US Open National Playoffs men’s title for a second straight year to earn a wild card into the US Open Qualifying Tournament, where he reached the second round (also for a second straight year). Teenager Robin Anderson won the US Open National Playoffs women’s singles title, prevailing over a series of more experienced opponents. Anderson was a girls’ singles quarterfinalist at the 2010 US Open and now plays for UCLA. The winners of the inaugural mixed doubles title were Christina Fusano and David Martin, who between them have won 34 USTA Pro Circuit doubles titles. The duo faced No. 5 seeds Daniela Hantuchova and Mark Knowles in the first round of the 2011 US Open mixed doubles tournament. The US Open Qualifying Tournament will be held August 21-24 and the US Open Mixed Doubles Championship begins August 29 at the USTA Billie Jean King National Tennis Center in Flushing, N.Y. The 2012 US Open begins on August 27.